I recently bought a fountain pen. I’m not sure why, as it was expensive, and I don’t seem to have a lot of call for such a pen. Now, it’s not that I don’t write by hand. I do. A lot. As an ethnographer I am always taking notes when I’m “in the field”. However, I usually use a biro, or sometimes a pencil or two. I’m quite fussy about the biros and pencils; I like them to have a certain weight. I don’t like a writing instrument that feels as if it might blow away. I want something solid in my hand. If I’m going to sketch something, which I also often do in ethnographic research, I like to have a black ink pen handy – you know, the kind that leaks when you’re on a plane. I’ve often mistakenly left a black ink pen in my bag and then covered myself in a hard-to-wash-off inky mess when I next take the lid off. Maybe that’s happened to you too. Like a lot of people I keep handwritten notes of meetings in a diary-style notebook. There are generally lots of ‘to do’ lists in those books, often with far too little crossing out as things actually do/don’t get done… But I wouldn’t use a fountain pen for this kind of meeting work. Too pretentious perhaps, or just too easy to lose the pen! I’m really not sure why I bought this particular fountain pen and at this time. Some kind of nostalgia, perhaps, for an era when I used to write most things by hand? I’ve been musing recently on how writing may have changed with the advent of the computer. I don’t mean just the act of typing, but the actual processes of composition. Although I’m a planner, I think that I planned a lot more when I wrote by hand and then typed up the nearly final version. It’s so easy with a computer to cut and paste, to remove things and to re-order. I can remember going into a creative writing class to show students my own hand-written version of cut and paste… it was not unusual for me, pre computer days, to physically cut up a text and stick it back together with tape. So my manuscripts not only had pages with lots of scribbled insertions, arrows and crossing out, but they also usually only hung together thanks to Richard Drew (he invented Scotch tape). The students were often amazed at the amount of revision that went on before the final copy was typed – and that of course was the point I wanted to make. I too am often amazed by the amount of revision that some writers do. 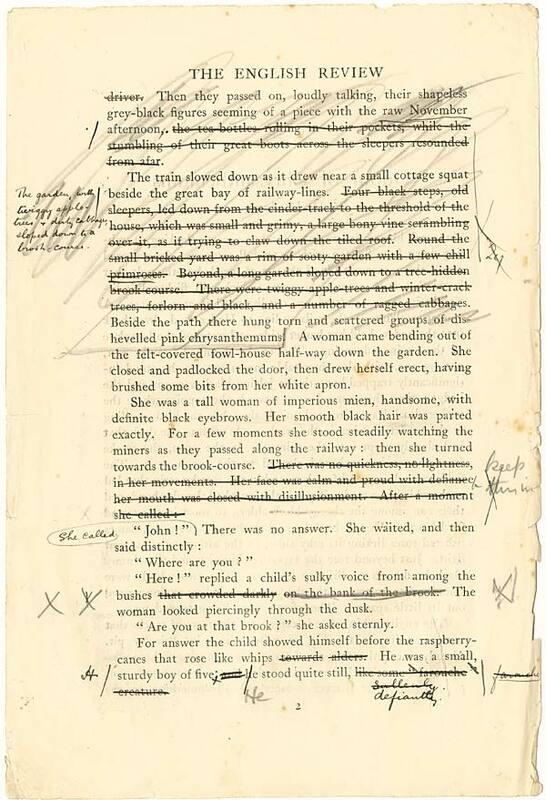 I am particularly interested in the way that some writers kept revising and revising their galley proofs. D H Lawrence for example, treated his galley proofs as if they were simply the next version of the story for him to work on. I can only imagine what his publisher thought of the expense of having to typeset and then re-typeset and then re-typeset again. But I don’t have someone else to type out my manuscripts, I must do this myself. And academic writers are not given the luxury of making substantive changes to their manuscripts after they are set. We have to keep changes to a minimum. So we are accustomed to having to get our revisions done before we submit our work. And writing on a computer does in fact save one of the steps – rather than write by hand and then type, we type and can revise much more easily on a computer, we don’t have to redo the entire manuscript each time. Perhaps then this is not why I bought the pen. “… continuous flowing gestures not a sequence of discrete letters. Ingold says that he encourages his students to write by hand in order to reawaken a sense of personal involvement in authoring which, he suggests, can lead to different and often profound insights. There’s a pleasure arising from the act of writing itself, rather than just from the production of text. Maybe it is the act of writing itself that I want to get back to. I used to like handwriting as a child. I enjoyed the aesthetics of a neatly written page, and the pleasures of copying out texts I liked. Maybe this is what I want to try to recreate. As yet, I don’t know. My new fountain pen sits in its box, waiting for me to discover what use I have for it. We will see. PS. If you too want to wonder about when to use a fountain pen like mine, and can afford this luxury, then they are sold online. This entry was posted in academic writing, fountain pen, revision, Tim Ingold and tagged academic writing, fountain pen, Pat Thomson, revision, Tim Ingold. Bookmark the permalink. 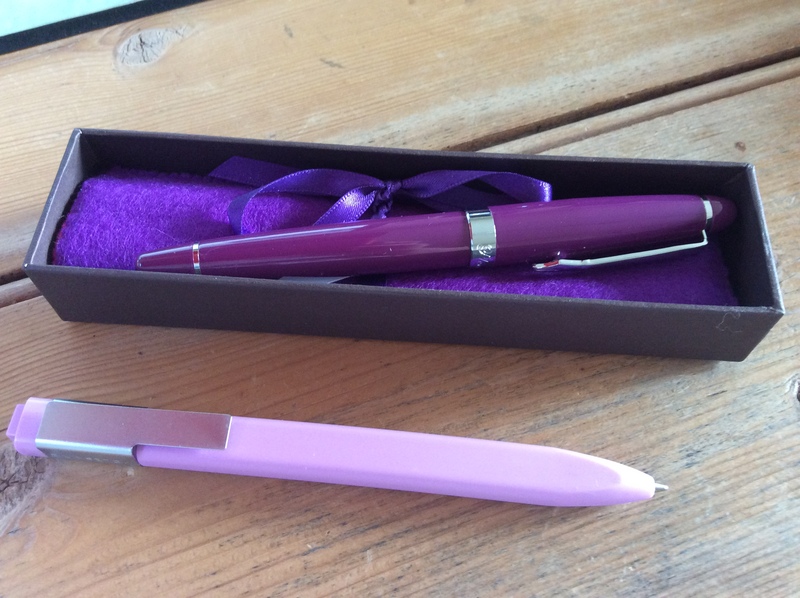 I LOVE a good pen – and I always find that handwritten notes stick in my head much more than anything I type! I confess to being a fountain pen addict. I have 6 in a pot on my desk at present – plus one with an extra broad nib and highlighter ink. Each pen is slightly different in size and weight – and is filled with a different colour of ink. I virtually always write initial drafts by hand – and use a fountain pen for working with printed typed drafts. Yes, I do have pencils and ballpoints as well, but I love the fluidity of real ink in a good quality pen. It is worth looking for a good quality coloured ink that fits with the use you want to make of the pen – I have found Herbin and Diamine ranges good – and particularly like the ‘imperial purple’ and ‘lie de thè’ but tend to use ‘lierre sauvage’ for everyday – I purchase from various suppliers online. Call me old-fashioned but I find a fountain pen to be ‘proper’ writing. I have a wonderful old pen for general notes and draft writing, a cartridge fountain pen for out and about, and another with red ink for editing of my drafts – I use a lot of red ink! They are a joy and, for me, an encouragement to write. I always draft and plan by hand, then type up later. Your post made me reflect more on why I do this. It is not because of a romantic attachment to handwriting. If anything it is frustrating having all my thinking on paper rather than in a digital document, because it is not searchable and easily lost. The reason I do it is that I can’t think by typing, whereas I can think by writing. I can make any marks I like on paper, externalising my thoughts more easily. Also writing on paper feels less final, and that feeling gives me more freedom to write something down, without worrying about getting it down right. I totally get this, Pat! I love a bit of retro writing or sketching for that reason of investing in and connecting to the work in a tangible, physical way. And as James says, thinking through writing. When I went to New York on a work trip I was all about the old school tools – https://theeduflaneuse.wordpress.com/2014/10/07/travelling-toolkit/ – although I also blogged. Enjoy your pen! I’m glad you’ve joined the club of modern retrogrades, Pat. We’re a goodly company, not at all inferior! My bugbear is poor quality paper. You can’t write on cheap stuff, esp. the recycled variety ~ ink just bleeds across the page. Also, my handwriting’s suffered from lack of use. Virtually constant keyboarding doesn’t help one to retain fine motor skills, but unfortunately I touch-type far, far faster than I can write by hand. The tools we use shape the way we use them. I find I write differently with a fountain pen than with a roller-ball. The pen feels different to hold, and to use. Good tools do matter.